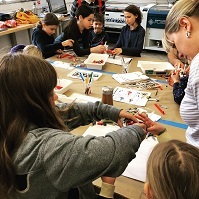 Homeschool groups are invited to join us for a fun and interactive STEAM workshop each month during the school semesters. The goal is to connect different groups of homeschool students and provide a platform to explore exciting and creative topics every month in an inspiring setting. All materials are provided, but space is limited; please register to confirm your spot. Appropriate for ages 6 and up. Younger siblings are welcome with direct adult supervision and older students are encouraged to attend to assist as mentors.